Q1. In Fig. 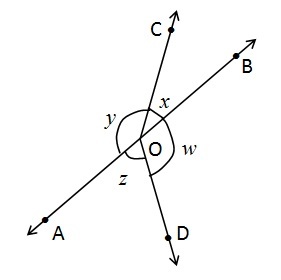 6.13, lines AB and CD intersect at O. 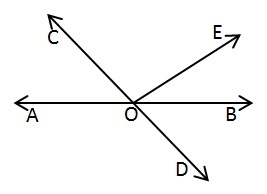 If ∠AOC + ∠ BOE = 70° and ∠BOD = 40° find ∠BOE and reflex ∠COE. Q2. In Fig. 6.14, lines XY and MN intersect at O. 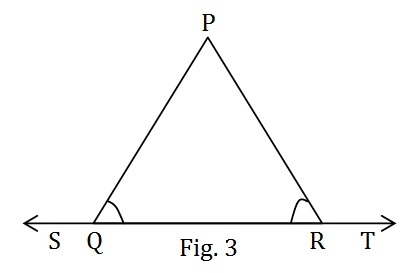 If ∠POY = 90° and a : b = 2 : 3, find c.
Q4. In Fig. 6.16, if x + y = w + z, then prove that AOB is a line. To prove : AOB is a line. another ray lying between rays OP and OR. Q6. It is given that ∠ XYZ = 64° and XY is produced to point P. Draw a figure from the given information. If ray YQ bisects ∠ ZYP, find ∠ XYQ and reflex ∠ QYP. 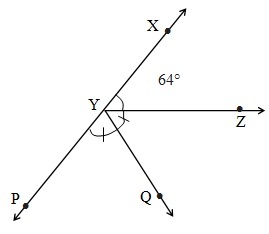 Given: ∠ XYZ = 64°and XY is produced to point P. YQ bisects ∠ ZYP. To Find: ∠XYQ and reflex ∠QYP. 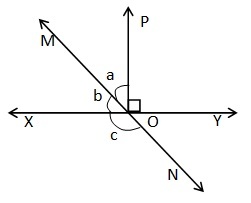 ∵ XY is produced to point P.
∴ PX is a straight line.